Bay Transit is the public transportation authority of Bay Aging, a charitable, non-profit organization serving seniors and people with disabilities for over 30 years. However, Bay Transit serves “All People, of ALL ages, for ALL reasons.” Bay Transit serves the Northern Neck-Middle Peninsula of Virginia as well as New Kent and Charles City counties, an area of nearly 3000 square miles that includes 12 counties and has an estimated population of 150,000 people. 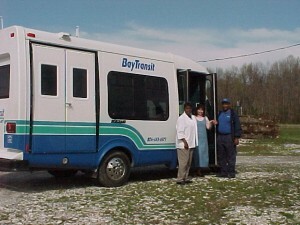 Bay Transit initiated service in Gloucester County in 1996 with one bus. We have grown and are currently in twelve counties (Charles City, Essex, Gloucester, King and Queen, King William, Lancaster, Mathews, Middlesex, New Kent, Northumberland, Richmond, and Westmoreland). During fiscal year 2013 Bay Transit provided over 159,000 one way rides with over 40% being work related.